In addition to the extruder, a complete process line comprises weighing and feeding the mix before the extruder, and cooling, flaking and grinding after the extruder. Baker Perkins works with a number of different partner companies, who can supply all the pieces of equipment required to put together a full process line. Each of our partner companies specializes in their particular technology, so customers are assured of excellent performance throughout the process. Working with partners ensures that the capacities of the individual units are matched, and mechanical and electrical interfaces are optimized before the equipment arrives on site. Raw materials are converted into a homogeneous mix before being fed into the extruder. Equipment for the cooling, solidifying and flaking of viscous materials; our partners offer a selection of different cooler types, designed for both typical applications and specific industry needs. Mills grind the flaked chips into a powder of a specific particle size and distribution. 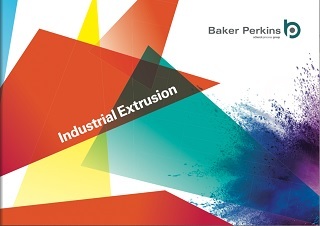 Developed specifically for Baker Perkins' extruders, our advanced, fully integrated control systems provide clear, at-a-glance visualization of the process, including current status of all major components and parameters.